Ziad Abaza stars in K-Shop, Dan Pringle’s take on Sweeney Todd relocated from a barber shop over a pie store on Fleet Street to a Bournemouth high street kebab shop. Mike Barnard and Ann McManus check out the thriller about a student-turned-serial killer spurred on by the horrors of UK nightlife. Pringle directs with real menace for what could become a cult favourite. He Said: “Booze Britain meets Sweeney Todd in Dan Pringle’s thriller that sees the story of the Demon Barber of Fleet Street brought to the very modern-day setting of a kebab shop in Bournemouth. When the father of undergrad student Salah (Ziad Abaza) dies at the hands of drunken customers, Salah inherits his dad’s kebab shop which leads to him neglecting his studies and grow an increasing dislike of the behaviours of his drunken late night clientele. One night he winds up in a brawl with a customer that leads to their death, and soon after he’s serving up human meat as a way of disposing of the body which makes for a surge in the shop’s popularity. “Writer/directer Pringle captures the binge drinking culture of UK towns and cities perfectly by using montages of post club chaos on the streets to set the scene and mimicing the foul-mouthed banter heard in fast food shops that dare to open late - it’s easy to get on side with Salah’s hatred towards them. The dark tone of the movie might have lent it to being a slasher-fest with the emphasis on blood-spraying horror at every opportunity, however Pringle opts against showcasing grizzly deaths in favour of delving into Salah’s mind-set. Supporting cast members include an egotistical club promoter providing new venues for Bournemouth’s worst to get pissed in, a shop assistant who appears to dislike the customers as much as Salah does and a love interest who offers another viewpoint on Salah’s character. “K-Shop works best in its initial act, building up to Salah’s first kill with a dark, brooding atmosphere. 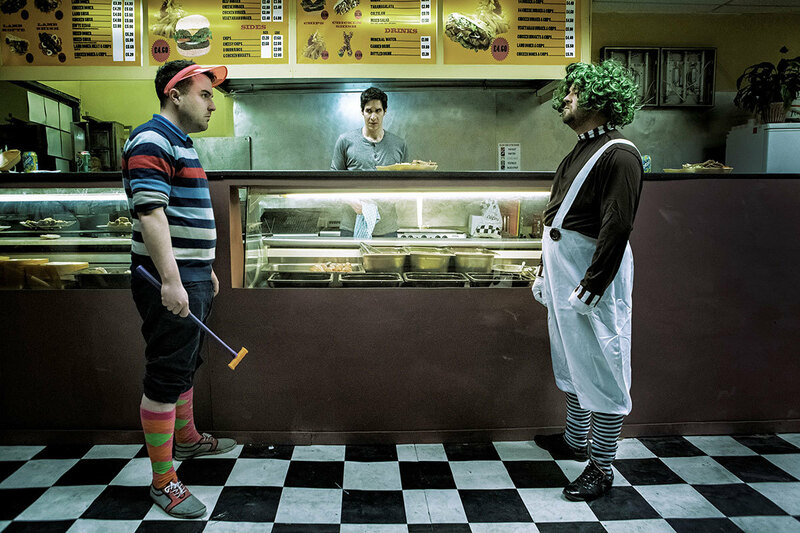 The stripped lighting in the kebab shop gives the actors a stark, metallic sheen that emphasises the rotten cores of the drunken rabbles who abuse Salah and his customers, all the while playing on the idea that you or at least a friend of yours has been that person on a late night food binge who’s got into a squabble. When Salah exacts his first revenge kill, you’re rooting for him as he chops up the victim to be put through the meat grinder. She Said: “As typical of slasher movies, providing a compelling synopsis is difficult. Although its synopsis reads as a shallow horror flick, K-Shop is deeper than made out. With topical themes of immigration, binge drinking and racism, writer-director Dan Pringle covers a lot of ground in a plot loosely following the storyline of Sweeny Todd. “The majority of the film is set in a bland Turkish kebab shop in Bournemouth (although the town is never attributed in the film), across from which a trashy nightclub frequented by the purveyors of the worst of British binge drink culture. Between scenes, interludes shoot the hideous behaviour taking place in the neighbourhood. Reminiscent of Booze Britain, with fast CCTV style shots of drunken revellers accompanied by a selection of rave-scene anthems, a distinct sense of disgust and dismay builds. 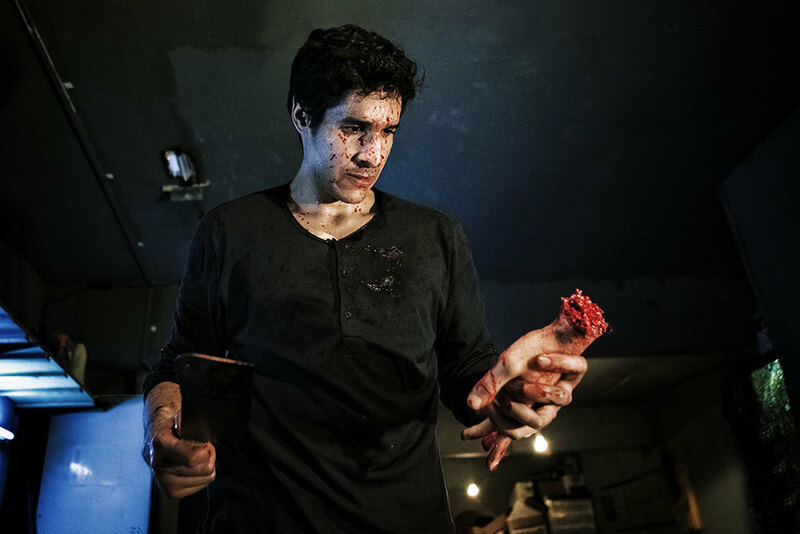 “The storyline begins with a violent incident in the kebab shop, in which Zaki (Nayef Rashed) is killed by drunken yobs, forcing his son, Salah (Ziad Abaza), a sharp politics student to take over its running. Riddled with debts, Salah’s distress at not being able to place a meat order coincides conveniently with one of many disgusting drunken altercations by a punter. In a fit of rage, Salah takes revenge for the odious behaviour he and his father have had to endure, killing the lout in a gruesome struggle. Suddenly seeing an answer to his inability to source meat, Salah sets out on a revengeful series of fatal attacks on the diners who subject him to racist insults and aggression. Processing them into ‘lamb’, as one of many dark humoured twists, Salah turns the shop around, gaining popularity for his prize-winning kebabs. “The stark contrast between the method of shooting the plain kebab shot and the dimly lit basement give the filming an edge. The red florescent signs and blue toned lighting make the basement where Salah slices up his victims appear like nightclub itself. Ironically, in comparably lit rooms on either side of the street, both Salah and his victims judge one another, yet act equally reprehensibly. “The plot thickens as the police start tracing the missing victims, a love interest is introduced and Salah’s growing rage begins to focus on the owner of the nightclub, a local celebrity Jason Brown (Scot Williams). Relying more on dialogue than gore as the film draws to an end, the repulsive characters open up to admit the weaknesses that drive them to their wild partying. While conclusively, this does nothing to repose Salah’s grief, the audience see him totter before the film ends with all guns blazing. She Said by Ann McManus.